Mobile is the Gulf Coast's least crowded cruise departure port. Why fly to a hectic big city when you could drive to this easy modern cruise departure port? 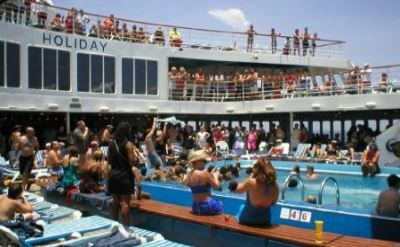 Cruises from Mobile Alabama go to Mexican resorts on Carnival Cruise Line. See the full schedule of departures below. 4-day cruises to Cozumel on Carnival Cruise Line. Round-trip from Mobile to Cozumel (Mexico). • 2019 departures: March 14, 28; April 11, 25; May 9, 23; June 6, 20; July 4, 18; August 1, 15, 29; September 12, 26; October 10, 24; November 7, 21; December 5, 19. • 2020 departures: January 2, 16, 30; February 13, 27; March 12, 26; April 9, 23. 5-day cruises to Mexico on Carnival Cruise Line. Round-trip from Mobile to Cozumel (Mexico) and Progreso/Yucatan (Mexico). • 2019 departures: March 4, 18; April 1, 15; May 13, 27; October 5, 14, 19, 28; November 2, 11, 16, 25, 30; December 9, 14, 23, 28. • 2020 departures: January 6, 11, 20, 25; February 3, 8, 17, 22; March 2, 7, 16, 21; April 13, 27. 5-day cruises to Mexico on Carnival Cruise Line. Round-trip from Mobile to Costa Maya (Mexico) and Cozumel (Mexico). • 2019 departures: March 9, 23; April 6, 20, 29; May 4, 18; June 1, 10, 15, 24, 29; July 8, 13, 22, 27; August 5, 10, 19, 24; September 2, 7, 30. • 2020 departures: April 4, 18. 10-day cruises to the Panama Canal on Carnival Cruise Line. Round-trip from Mobile to the Panama Canal (partial transit), Limon (Costa Rica), Mahogany Bay (Honduras) and Cozumel (Mexico). • 2019 departure: September 16. 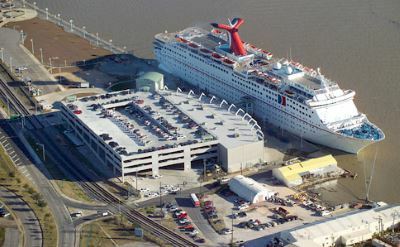 The Mobile AL cruise terminal is downtown, close to hotels and restaurants, less than a mile from I-10. A parking deck is attached to the terminal.